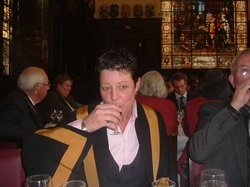 Worshipful Company of Blacksmiths Award - Michelle J Parker. 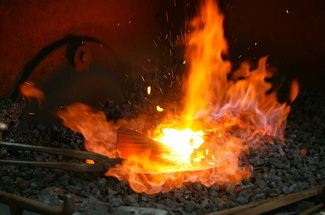 Master Blacksmith. Is it a woman’s prerogative to be late? 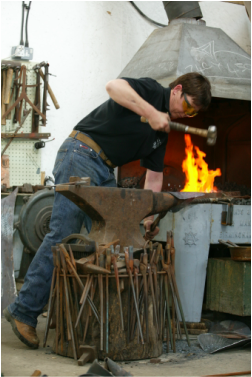 Master Blacksmith Michelle Parker certainly doesn’t think so – however on 16th October 2008 (on what she describes as one of the most important days of her life) she made history – twice in one day! Self employed Worcestershire business woman and senior lecturer in blacksmithing at Warwickshire College, Michelle is now the first professional female blacksmith to be appointed as a Liveryman of the Worshipful Company of Blacksmiths. This is in their entire 700 year history, since being incorporated by prescription by King Edward I in 1325. But Michelle almost missed the pomp because a London cabbie was relying on sat-nav rather than traditional street knowledge and she ended up miles away from the ceremony across the other side of the city. Arriving an hour late, the historic society decided to make an exception and for the first time on record held the Court open so that Michelle could be sworn in as a Liveryman, So, instead of taking the oath in front of just a handful of people she then had to read it to an audience of more than 200.